The picture has been posted to the Wisconsin progressive blog Democurmudgeon, although I’m not sure who took the picture. If anyone can provide me the name of the photographer who took the picture above, I’ll add a caption giving credit to him or her. I don’t eat barbecue ribs, but I do eat chicken strips from time to time, and I prefer to dip chicken strips in barbecue sauce. I never wear gloves or a bib while eating chicken strips, and I don’t have a problem at all if some of the barbecue sauce gets on my hands or clothing. After all, I can always wash my hands, and every article of clothing I have can be machine-washed. Remember, this is the same Scott Walker who bizarrely claimed that his experience taking on teachers’ unions (in reality, he hid from teachers, public employees, and other hard-working Wisconsinites while he took away rights from Wisconsin’s public employees nearly four and a half years ago) means that he can take on ISIS and other terrorist groups, which was an absolutely absurd and offensive comparison. 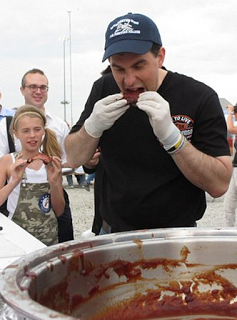 If Walker thinks that barbecue sauce is a mortal enemy to his hands, then how the hell is he supposed to take on ISIS and Vladimir Putin?